Please be advised: Players from United Kingdom are not accepted at Wild Tornado Casino. Try one of the three casinos below, as they welcome UK players with great bonus offers! Wild Tornado aims at delivering an online casino gaming experience that players will never forget, just as they would never forget a tornado. The online casino is based on the storm theme as it encourages players to choose from three guilds—tornado, storm, and lightening. Players’ gaming experience, including the loyalty bonuses they can claim, depends on their chosen guild. Wild Tornado is ideal for Aussie players who use bitcoins as it supports play in bitcoins and offers generous bitcoin bonuses. The highlights of the online casino are its unique tornado theme, three-level welcome bonus, 24/7 live support, 100% security, 2000+ multi-provider games, and lucrative weekly offers. The online casino maintains a blog, regularly communicates with its customers through email and text messages, and supports responsible gambling. Licensed in Curacao, Wild Tornado focuses on delivering an innovative gaming experience and succeeds in doing so. Wild Tornado Casino is an instant play online casino that works well on iOS and Android smartphones and tablets. Since its gaming platform is based on HTML5 technology, the games can adapt to any device. The best thing about this software is that it requires no download. To play their favourite online casino games, players only have to tap or click on game icons of their choice. The game will then instantly load on their browser provided they use fast and reliable Internet connectivity. Getting started at Wild Tornado Casino is as simple as clicking on the green Sign Up button on the left of the casino website. When players do so, a registration form appears on their screen. 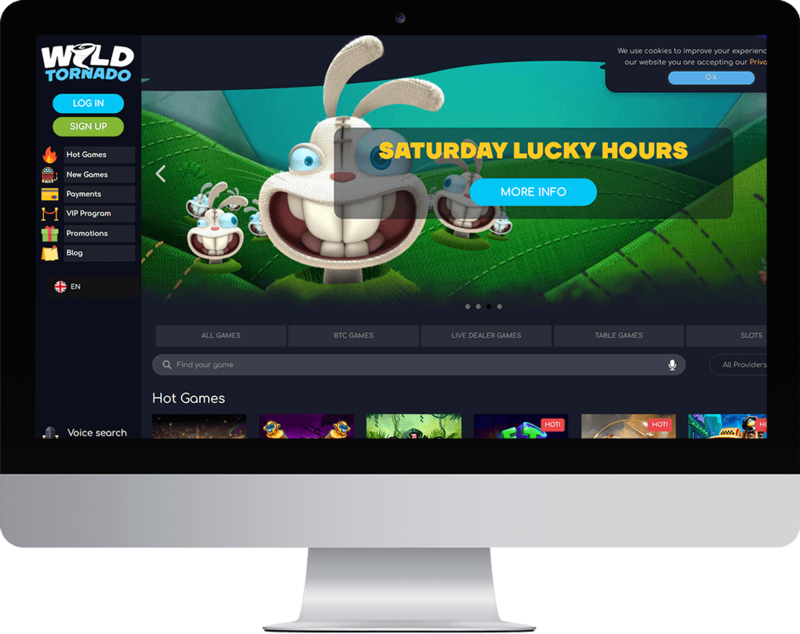 The registration procedure hardly takes any time at Wild Tornado and players can log in to their newly created gaming accounts. Once logged in, they can easily load the games on their browser and start playing for fun or real money. Since Wild Tornado has an excellent, convenient, and easy-to-navigate website design, players don't have to click too many links to reach the game library. They just have the scroll down the homepage a bit to view the complete game library. Wild Tornado offers an impressive selection of three-reel slots and video slots such as Lucky Firecracker, Mustang Gold, Crystal Crush, Golden Ox, and Casino Cosmos. Wild Tornado has recently introduced games such as Neon Bar, Circus of Horror, Wild Falls, and Faerie Spells. Play table games such as Baccarat, French Roulette, Pontoon, and American Roulette. Play progressive games such as All American, Slots Angels, Leprechaun Goes to Hell, and Mega Joker for an opportunity to put thousands of dollars in their pockets. Play lottery games such as Monkey Keno, Flying Pigs, Jackpot Keno, Keno Pop. Wager bitcoins on games such as Fire Lightning, American Roulette, Aztec Magic, Desert Treasure, European Roulette, and Domnitors. Some of the hottest or most popular games in the library are E.T Lost Socks, USSR Seventies, Vikings, Coins of Egypt, and Aztec Magic Deluxe. Choose from video poker games such as Bonus Poker, Five Draw Poker, Tens or Better, and Multiwin. Wild Tornado is mobile friendly. To get started, players only have to visit Wild Tornado Casino on the browser of their iOS or Android smartphones and tablets. Since the gaming platform is based on HTML5 technology, players don’t have to download any native mobile gaming app or software program. As long as they have a mobile device that supports HTML5 and reliable Internet connectivity, they can load the games quickly and smoothly on their mobile device browsers. The promotions at Wild Tornado Casino include not just a three-level welcome bonus, but also daily bonus offers. At the time of writing, the hottest promotion at Wild Tornado Casino is its weekly bonus offers. Monday Fiery Sevens: Players can claim 77% reload bonus of up to €100 or 0.01 BTC whenever they top up their account. Tuesday Cashback: On Tuesdays, the online casino offers 50% cashback on players' deposits. Thursday New Game: On Thursdays, players can claim free spins on brand new games. 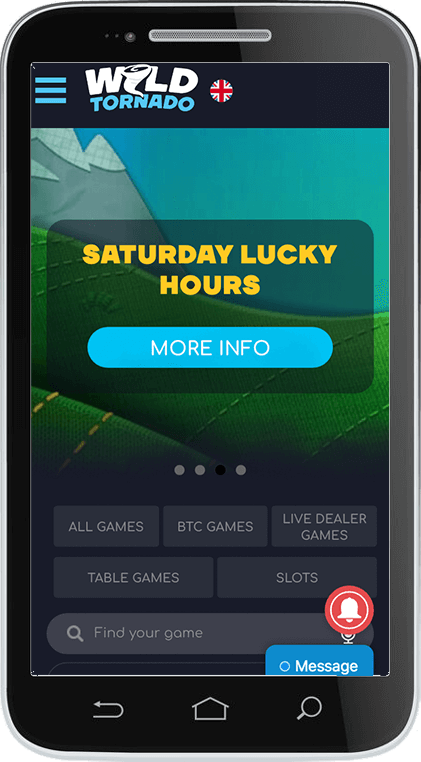 Saturday Lucky Hours: Saturdays are loaded with lucky hours, during which players can claim free spins on featured slots. Sunday Cashback: Wild Tornado has devoted its Sundays to cashback offers. The size of the cashback players can claim depends on the size of their deposits and their wagering activity. The VIP Club at Wild Tornado Casino features three VIP guilds, each of which is devoted to a different set of bonus offers. If players like cashback offers, they should select the Tornado Guild. If they like complimentary points on their real money play, they must choose the Lightning Guild. And if they like free spins, the Storm Guild should be their choice. The VIP Program challenges players to choose their preferred type of bonus and their guild at the time of registration. Next, players should play for real money as much as they can to achieve levels and unlock bonus offers. For example, players who achieve the third level of the Tornado Guild can claim 12% weekly cashback. Players who achieve the third level of the Lightning Guild can claim 10% weekly cashback. Players who achieve the third level of the Storm Guild can claim bunches of free spins on featured slots. Wild Tornado offers a number of reliable payment options to make it easy and hassles free for players to deposit and withdraw money. The maximum and minimum deposit limits vary according to preferred currency and preferred payment option. Credit Cards: MasterCard and Visa: Players residing in Australia cannot use Visa credit cards. However, they can use MasterCard instead of Visa. The processing time frame for Visa and MasterCard credit cards is usually around 1 - 3 banking days. CoinsPaid: This is an instant and free withdrawal option for Bitcoin users. The online casino takes 24 hours to process withdrawals. Players can further reduce the withdrawal time frame for their preferred payment method by sending Know Your Customer (KYC) documents to the online casino well in advance. Frequently Asked Questions (FAQ): Players can check out the FAQ page for answers to commonly asked questions. Bitcoin Guide: This is for players who want to know more about using Bitcoin. Complaints: If players have a complaint, they can either use the AskGamblers complaints service or complain directly to the online casino through an online contact form. Email: Players can email their doubts and questions to support@wildtornado.com. Live Support: Players can click on the live chat icon at the bottom right of the casino website to talk to a customer support agent. Wild Tornado is one of the best online casinos for Australian players as it supports wagering in AUD and offers Australia friendly banking methods such as credit cards and Neosurf. Our team spent some time playing at Wild Tornado and testing its customer service. Based on our experiences, we have concluded that Wild Tornado is indeed worthy of recommendation.